In September, along with harvest festivals of many faiths, we celebrate successful crops and all things organic. Organic is old news. We often think of organic foods as being somehow exotic but before chemical fertilizers were invented, in the 1850s, organic was all we had! This is normal, natural, and the way things have grown for millions of years. Food produced in this way is what our bodies are designed to run on. Is it any wonder that chronic disease is on the rise when the foods we eat are laden with toxic pesticides, herbicides and GMOs (genetically modified organisms)? It’s hard work for our bodies to eliminate these unnatural substances. Nevertheless, whatever is in your food ends up in your body. It is always wise to steer clear of unnatural substances and anything that can be regarded as toxic. For optimum health we should stick to the foods for which our bodies have evolved. Organic meat, fish, eggs and milk come from animals that are fed a natural diet and are not pumped with antibiotics or growth-promoting hormones. Another important point is the energetic effect of consuming foods which are badly-produced. If an animal suffers during its life before you eat it, some residue of that negative energy must be carried in its meat. The same would be true of milk or eggs from animals that have been reared in poor conditions. Such energy could be regarded as toxic, as it needs to be eliminated from the body just as a chemical would be. So whether from an energetic stance or care for the welfare of animals or consideration for the chemical load placed on your own body, there are many reasons to consider choosing organic animal products. If I eat organic, do I need supplements? Are nutritional supplements really necessary if we are eating nutrient-rich organic foods? For anyone living on top of a mountain, the answer is probably not. Natural foods in a natural environment should provide balance and enable the body to function well. But for those of us living in polluted urban environments, I believe that natural foods are not enough. In cities our bodies have additional toxic loads to get rid of, using up large amounts of nutrients in the process. Not all supplements are created equal, and some are padded out with mineral fillers and non-organic substances which require elimination along with other toxins. Fortunately, it is possible to find supplements that are organically-produced and made up in capsule form with vegetable fillers. Those are some important considerations at a personal level. Should we be worried about the rest of the world? The more we eat organic, the fewer fields will be sprayed with the chemicals which ultimately threaten the survival of all animals including ourselves. The routine use of antibiotics is forbidden on organic farms. Organically-reared animals are only medicated when ill, unlike animals on conventional farms. What does all this mean for your weekly shop? Let’s be realistic. Most of us are pushed for time and money, so how can we adapt to organic products without breaking the bank or making shopping time-consuming and complicated? At one time it was a lot more expensive to buy organic than chemically-grown produce, but the gap is closing as demand for organic foods increases. Some items, such as organic eggs, are much more expensive than ordinary free-range. But many fruits and vegetables are only a little more pricey than the non-organic alternatives. Organic fruits and vegetables represent good value for money, when you consider that the purpose of food is nutrition, and organic fruit and vegetables give you a lot more nutrients per kilo. It is becoming a lot easier to find organic products nowadays. Most supermarkets now stock them. The cheaper supermarkets, such as Asda, have a limited range. Waitrose, at the other end of the spectrum, has an entire section devoted to organic produce and some frozen and tinned organic vegetables too. 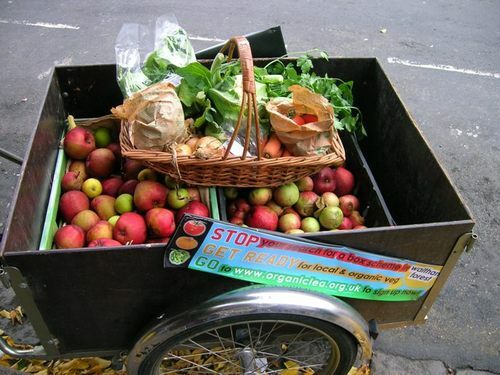 Some independent health food shops have fresh produce, and many towns now have a box scheme which delivers fruit and vegetables to your home or nearby pickup point. Organic market stalls are on the increase, and many products can now be ordered online. Simple’n’Natural, Wanstead E11 http://www.allinlondon.co.uk/directory/1175/60011.php No fresh produce but an excellent range of store-cupboard foods plus household and body care items. Second Nature, Wood Street E17 http://www.e17woodstreet.co.uk/shop/second-nature-wholefoods Foods, household, body care, fresh fruit and vegetables, plus their own box scheme. As Nature Intended –http:// www.asnatureintended.uk.com/ Up-market organic foods, remedies and body-care, located across London with two East End branches. Nutritional supplements http://silverray.eu.nspshop.com free from GMOs, pesticides and herbicides. As consumers and human beings, it is in our best interests to support natural farming methods and buy organic as much as possible. In my view, we can’t afford not to. I hope this has been helpful and informative. Let me know what you think! This entry was posted in Ecology and environment, Health, Nutrition, Supplements, Wellbeing and tagged animal cruelty, animal welfare, animals, antibiotics, bees, birds, box scheme, budget, chemical, chronic disease, dairy products, diet, eggs, endangered species, energy, fertilizer, fish, food, food chain, fruit, Fruit and veg, GMO, Health, health food shop, herbicide, hormones, market, meat, minerals, natural, nutrient, nutrients, nutrition, ocean, organic, pesticide, pollinators, september, shopping, soil, special offer, superbugs, toxic, toxin, vegetables, vitamins, wildlife. Bookmark the permalink.